the concept of avoiding people being foreign to them." For those who have visited Amsterdam, one thing probably struck you, like it did me (though I had heard all this before, seeing it is a whole other thing). The Dutch love riding bicycles — called ‘fietsen’, pronounced FEETS-un. They ride them everywhere and often, whether rain or shine. The city is filled with bike lanes too, so cars, trams, buses AND bikes can all share the road together. Except that cars and traffic are the ones who yield and show care to bikes. It’s amazing to come to an intersection on your bike and have the cars let you go even if they have the traffic light. A shrill ‘brrriiingg’ of the bell, and you will have people leaping out of your way as you buzz past. Riding a bike is a way of life in the Netherlands. The Dutch go to work, pick up groceries, or go out at night for dinner and drinks on their two-wheelers. It’s their daily method of transport. You see couples holding hands while cycling side-by-side. Parents riding next to their children, a hand on the kid’s back to guide them along. Moms riding ‘bakfiets’, or ‘box bicycles’ - bikes with a wagon attached to the front - with their kids snoozing inside. 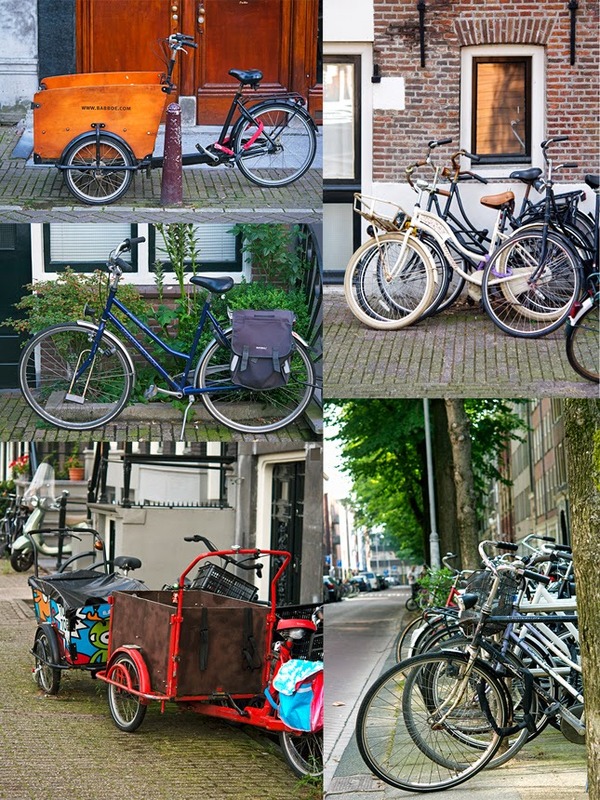 Bikes are so well ingrained in Dutch culture that on average, each household owns at least three. 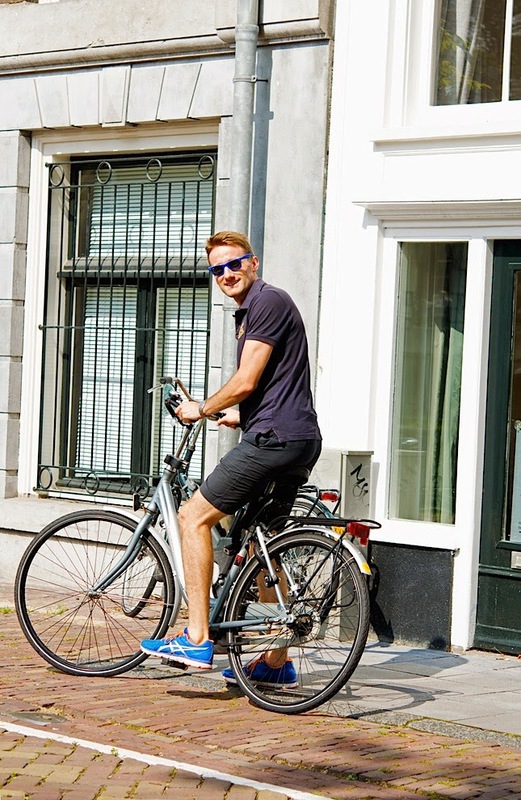 Riding bikes all the time might be one of the reasons why Dutch are very tall, very fit, and very good-looking. I’m dead serious people. It’s pretty rare to see an overweight person in the Netherlands. 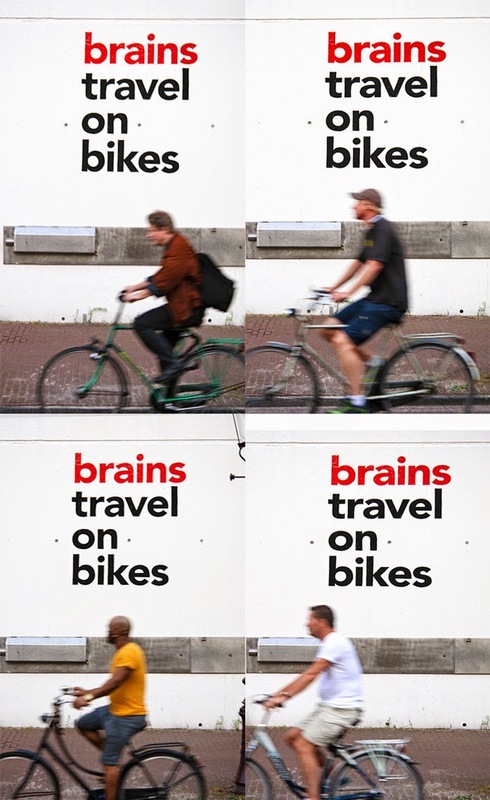 Health and good looks are just two of the positive externalities produced by riding bikes instead of driving. Others include: Cleaner air (because bikes, unlike cars, don't produce carbon emissions), reduced traffic congestion, lower health-care costs, stress relief and - more importantly- saving money: the average annual operation expense of a bicycle is about $308, versus more than $8,000 for car. So what are we waiting for people? Let’s hop on our bikes and save the world! As I wanted to “do what the locals do”, I borrowed my brother-in-law’s ride and hit the street of Amsterdam. Anyways, as I was riding through the streets of Amsterdam the other day, I passed by a food store that had in its windows Pop Tarts, Skippy peanut butter, Betty Crocker mixes and Frank’s Red Hot. I was just too curious, so I entered the shop to discover an array of Asian, Mexican, Southern, Tex Mex, and Southwestern products. Not to mention marshmallow fluff, root beer, various brands of BBQ sauces, and corn tortillas. The moment I spotted a can of ‘chipotle peppers in adobo sauce’, I knew right away I had to make my worldwide famous chipotle honey-glazed chicken. This chicken is sweet and spicy, not too spicy though. The spices provide flavor here but no real heat. 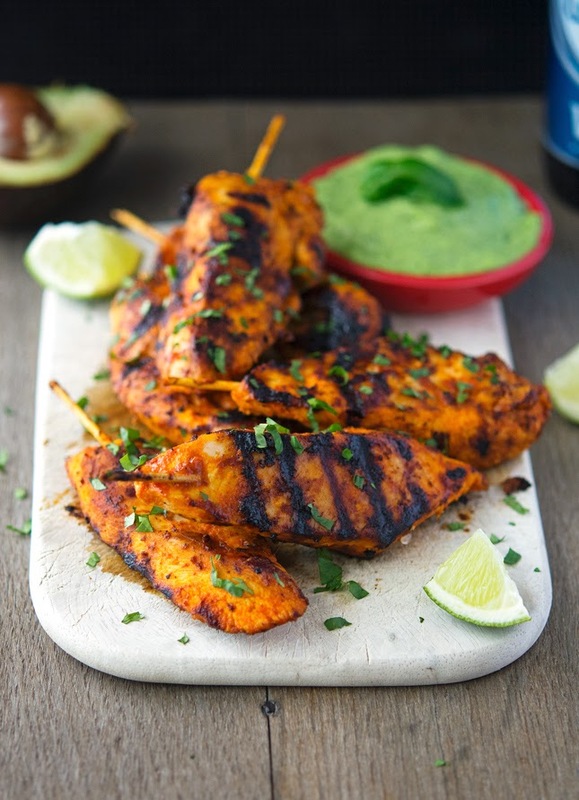 The woodiness and earthiness of the paprika, the sticky sweetness of the honey, the distinct smokiness flavor of the chipotle peppers in adobo sauce, make this chicken so worthy of your grill. The slightly sweet, slightly tangy avocado cream sauce is a wonderful compliment to the smoky flavor of the chicken, not to mention good enough to eat with a spoon. Avocados are great for making sauces because they are naturally thick and creamy. And of course they are delicious. This was a huge hit and once you sink your teeth into it, you'll know why. This Chipotle Honey-Glazed Chicken with Avocado Cream Sauce gets RAVE reviews every time I make it. Seriously, it's that good. Try it at least once. You'll be sure to make it again! 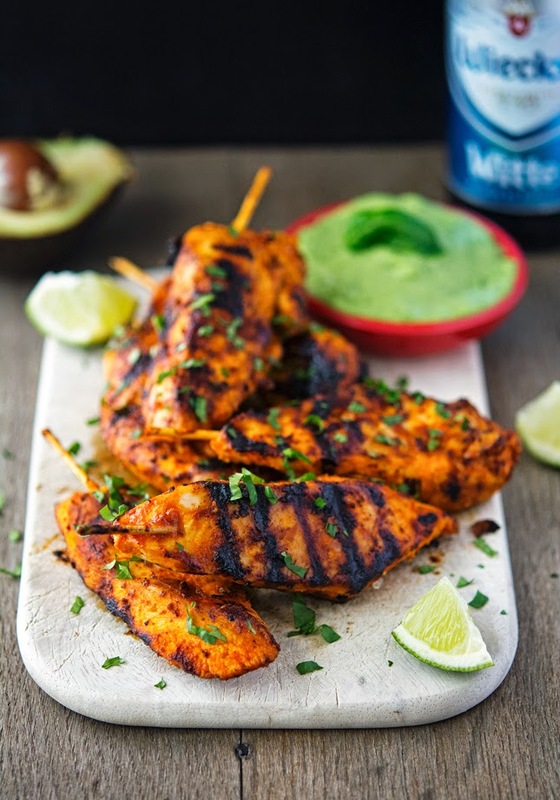 Chipotle Honey-Glazed Chicken with Avocado Cream Sauce Print this recipe! Combine chipotle chiles, garlic, honey, cumin, paprika, salt and olive oil in a food processor (or blender) and process until smooth. If it’s too thick add a couple of tablespoons of water. Combine chicken and marinade in shallow dish or ZipLoc bag. Cover or seal and marinate for at least 30 minutes (marinate overnight for fullest flavor). In the meantime make the avocado cream sauce. Place all ingredients in a food processor (or blender) and blend until smooth. Transfer to a small bowl and set aside. and cook chicken until nicely charred and cooked through (about 4 to 5 minutes per side). Transfer to a plate, sprinkle with chopped fresh cilantro, and serve with avocado cream sauce on the side. One serving sans avocado cream sauce yields 208 calories, 9 grams of fat, 10 grams of carbs and 23 grams of protein. One serving with avocado cream sauce yields 322 calories, 20 grams of fat, 15 grams of carbs and 24 grams of protein. I really enjoyed the pictures and that chicken looks amazing! Mike - you fit right in with those fit, good looking, Netherlanders, my friend! It's funny because I don't associate chipotle peppers in adobo sauce as very hot, probably because I only used them in marinades. Any-hoo I'm sure your daughter would love this chicken. It's super good! I would love to bike to wherever I'm need to go, it seems like a great way to stay in shape! However, I think a 40 mile roundtrip to farmer's market might just finish me off (things are miles and miles apart in Montana)! 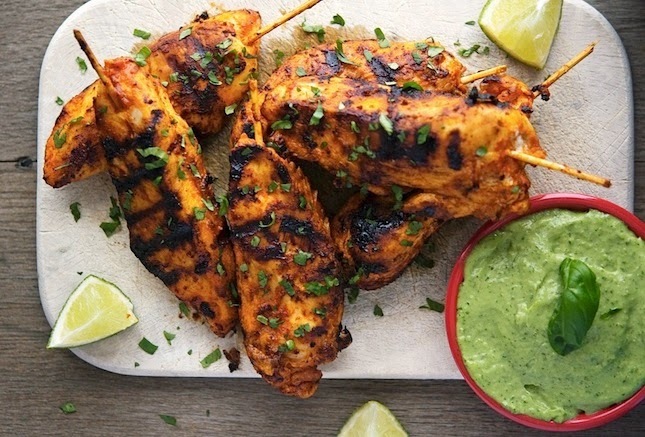 These might just be the best chicken skewers you've made yet - chipotle + honey = amazing every time! Yummy! Love a place where you can park the car and ride a bike everywhere. So not happening here in Atlanta however!! So many try, but really shouldn't with our curvy roads with no shoulders. I know Lauren, it will take a revolution for the US to become like the Netherlands, bike-wise of course! I could literally eat this every day, it looks amazing Mike!!! Ok first off Amsterdam looks awesome and how fun to bike everywhere! Secondly loving the flavor combo of this, sweet & spicy on the chicken and then creamy with the avocado sauce to cool down your taste buds. Pure genius, need to try this asap Mike! Genius? You're really flattering me Krista, aren't you? What a nice story about Amsterdam. Being from The Netherlands, it's nice to read how you've experienced the whole 'bike thing'. I alone have three bikes, one for racing, one for commuting and one foldable bike that I can take with me on the train. Do you happen to know where the shop is in Amsterdam? 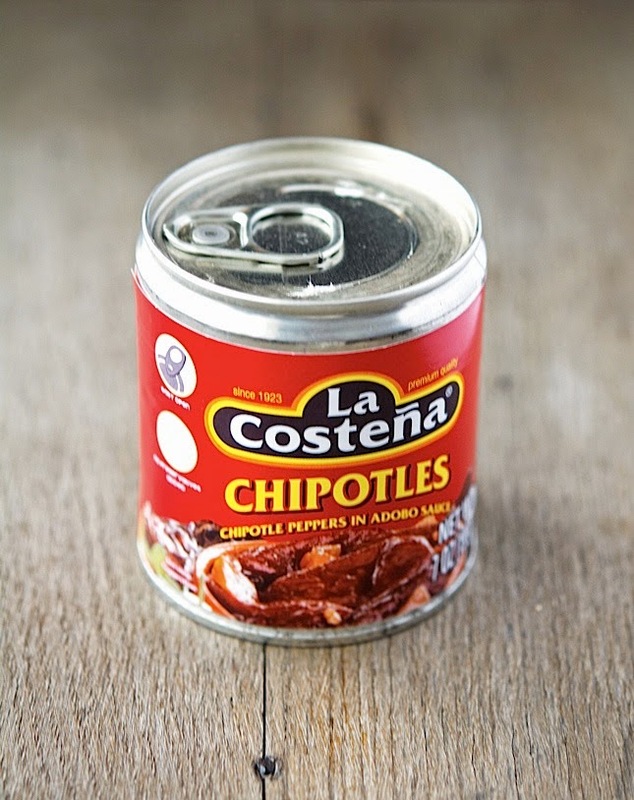 I live close by and am curious about making adobo sauce, but never managed to find chipotle peppers. I'd like to try this canned version. Sounds and looks like a great recipe. Hey Tess, luckily I've just found the receipt. The store is called Tjin's International Food Store and it's on Eerste van der Helststraat 64, 1072 NZ Amsterdam. Basically one block away down from the Albert Cuypmarkt. Sounds good? Great, thank you. I regularly go to the Albert Cuyp for buying fabrics. I'll visit the shop next time. Have a good time! Well, you definitely impressed your hosts with this meal - you got me at chipotle-honey-glazed, but then the avocado cream made me faint with joy. by the way, I will do my best to forgive you for the "very tall" = "very beautiful"
Well, I never said tall = good looking. I said that on average Dutch are tall AND good looking. So no tears, alright? :-) I am sometimes referred to as a Drama Queen. Unfairly so. wow.. this is some seriously good looking chicken! i definitely will be recreating that glaze in my kitchen. love it! Hi Mike, what a great post, love the idea of everyone riding bicycles, looks like a beautiful city. It's a fantastic place, definitely worth visiting! I'd love to visit Amsterdam one day. And I'm a sucker for anything with chipotle so I kinda want a piece of this chicken like right now. Amsterdam is a wonderful city, there's such a positive energy. I really love it here! I LOOOOVE sweet and spicy and these sounds FABULOUS!! Just tried this tonight and it was a hit! (Not that I'm surprised.) I started marinating the chicken this afternoon because I forgot to do it last night. I loved it and so did my friends - and it was so easy! Thanks for another great recipe! That's fantastic Adina. Thank you so much for taking the time to let me know, it makes me super happy!